Our technicians, watchmakers and specialist transform our customers’ wishes and requirements into technical data. 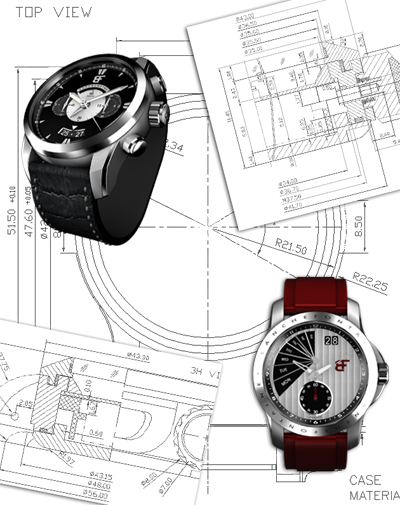 We use high-performance 3D software to design the plans and volumes of the components, taking all the demands of a Swiss Made product into account. Component sizing, tolerances, materials, security and waterproofing standards, comfort and reliability are all factors which are taken into account by our development office. We offer you the option of a realistic representation of your new creation, so you can inspect it down to the last detail. With this procedure you can make any final changes before the sample is produced, for your subscriptions, communications or campaigns. The realistic representation stage can be provided just 1-2 weeks after your order. The process of producing functional or non-functional samples takes 6 to 10 weeks depending on the degree of sophistication. This stage is recommended for final approval of the products before mass production, or to make any final improvements to the product.